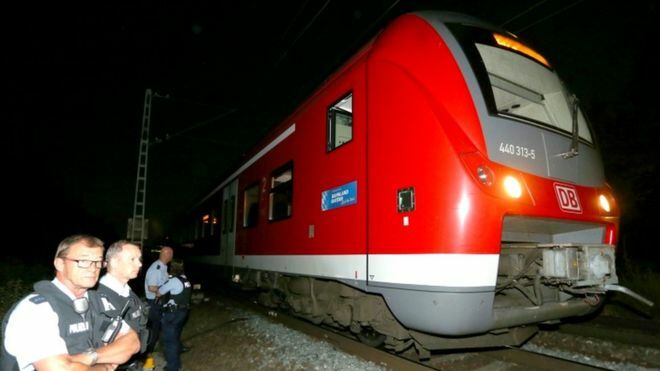 More than 20 people in Germany have been injured after a man with an axe went on the rampage on a train, German media report. A police operation including a helicopter was used in Heidingsfeld, a part of the city of Wurzburg in southern Germany. Local media (in German) tweeted that 21 people had been injured and a suspect was shot. The train line between Wurzburg-Heidingsfeld and Ochsenfurt is closed. The German news agency DPA reported that the police said some of the victims' injuries were life-threatening. A hand-painted flag of so-called Islamic State has been found in the room of an Afghan asylum seeker accused of carrying out an axe and knife attack on a south German train, officials say. The 17-year-old injured four people from Hong Kong, one critically, in the attack in Wuerzburg on Monday evening. He was shot dead by police as he fled. He had shouted Allahu akbar" ("God is great"), a witness said. The IS-linked Amaq news agency said the teenager was an IS "fighter". It said he had "carried out the operation in answer to the calls to target the countries of the coalition fighting the Islamic State".